Merio was one of the first people to contact me to find out more about the project, but we didn't get a chance to meet until today due to his busy schedule working as a journalist and trainer at TLMDC, the Timor Leste Media Development Centre. After growing up mainly in East Timor, in the late 90s Merio decided to head to Universitas Cendrawasih in Jayapura, West Papua to study philosophy. Much like in philosophy courses back home, they start with the Greeks and move on from there. Merio quickly realised that Eastern philosophy was his thing and, inspired by the violent revolution in Jakarta in 1998 and back home in 1999, he devoured everything written by Mahatma Gandhi, especially the principles of Ahimsa (non-violence) and Satyagraha (truth). He eventually wrote his thesis on the applicability of non-violent struggle in an Indonesian context. 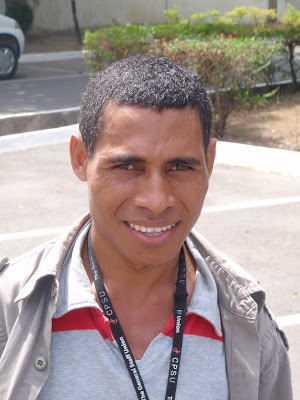 After completing his studies, Merio returned to Timor Leste in 2001 and began work as a journalist. While in Papua he had already written for many of the local newspapers so he was able to use that experience into a job contributing to the Union of Catholic Asian News service based in Bangkok and a number of local newspapers. When he returned to Timor in 2001, Merio packed up all the books he had accumulated during his university years and shipped them back to form the kernel of his own miniature library. Every time he goes to Indonesia now he tries to bring back a box of books to add to it. He finds it tough to add to his collection in Timor because books are so expensive, but when he has something he really wants he saves up money and orders a whole box of books through the Optik bookstore in Colmera to bring the shipping costs down. His collection includes some of his favourite authors including Albert Camus, Hannah Arendt, Friedrich Nietzsche and, of course, Mahatma Gandhi. Driven by what they saw as a lack of serious investigative journalism in Timor Leste, Merio and a few friends set up the Kla'ak blog where they post articles on politics, society, culture and economics with a humanitarian bent. While he writes mostly articles these days, Merio has filled a whole exercise book with poems and has written a number of short stories and longer fiction. He writes mainly in Tetum, but says he finds it frustrating as there is still no standard spelling or vocabulary and often needs to import words to flesh out his ideas. Merio hasn't yet decided what he wants to write about in his Istoria Timor, but the 2006 crisis is still weighing heavily on his mind and he would like a chance to try and deal with that.